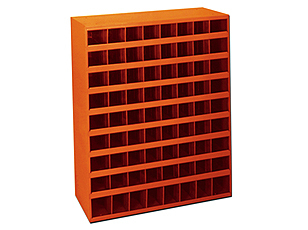 Description Empty hole bin, also known as large compartment bin, stock bin, bolt shelves. Dimensions: 36" W x 42" H x 12" D.
Holes pre-drilled for wall mounting. Empty hole bin, also known as large compartment bin, stock bin, bolt shelves. 40 hole compartments. Dimensions: 36" W x 24" H x 12" D. Holes pre-drilled for wall mounting. Space reserved for labels. 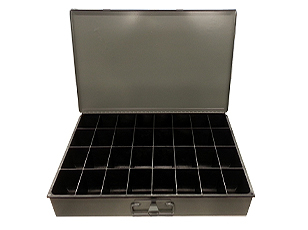 Empty hole bin, also known as large compartment bin, stock bin, bolt shelves. 72 hole compartments. Dimensions: 36" W x 42" H x 12" D. Holes pre-drilled for wall mounting. Space reserved for labels. 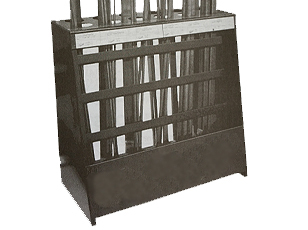 24" W x 13.5" D x 24" H. Sturdy frame, ideal for 36" rods, capable of holding longer lengths, including threaded rod, round bar, keystock, etc.